What struck me first was the title, The Stars Beneath Our Feet. Lyrical and evocative, the white lettering was stacked and drew your eyes down to the image of an African-American boy walking on a patchwork road of Legos. Stars peeked around the bricks and sparkled above. I was captivated and intrigued. Before long, the buzz about this middle-grade novel by David Barclay Moore was everywhere. Starred reviews. Best-of-the-year lists. Coretta Scott King/John Steptoe New Talent Award. A movie deal with Michael B. Jordan. Sometimes, I get ideas from dreams. I’m an active dreamer and can even shape the direction of some of my dreams, which can turn the whole process into a canvas for creativity. Weird things happen in dreamland. Years ago, I had a dream about a boy who built this whole city made of LEGO building blocks. It was vivid, fantastic. I woke up and wrote down the idea right away. I always keep a pen and pad of paper beside my bed for these occasions. For years, I had also wanted to write a story that dealt with the struggles of African American children, particularly boys, in some parts of Harlem. I used to live and work in Harlem. I had seen, heard and experienced a lot during my years there. Eventually, I melded my LEGO dream with my real-life Harlem inspirations and my novel, The Stars Beneath Our Feet, was born. When it comes to books, I have a pretty diverse appetite. I love literary novels, nonfiction, comic books, picture books. I love other types of books. But I also read many older works by authors. I’m not sure why I like classics so much. Perhaps I’m an old soul. One of my favorite children’s authors is Tove Jansson, who lived in Finland. I don’t think her work (novels, picture books and comic strips) is as popular among Americans as it is elsewhere, but I fell in love with Jansson’s children’s books as a boy. I recently began re-reading her work. Jansson’s tales about the Moomins, a family of rather philosophical trolls who live in the Finnish woods, are as introspective and dreamy as I remember. Despite being a debut author, I think I’ve been very fortunate to have received some great press and some notable recognition. 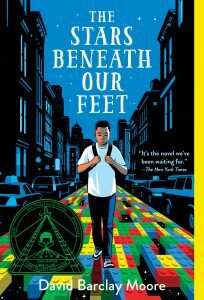 Two of the first to read The Stars Beneath Our Feet (before it was even published) were children’s book authors Matt de la Peña and Jacqueline Woodson. They are two of the best. And they each wrote terrific blurbs, or recommendations for the back cover of my book. That was remarkable. And I was further pleased when author Jason Reynolds offered a very positive blurb as well. It meant a lot to me that these busy writers took time out to read and encourage others to read my work. Additionally, profiles and reviews in The New York Times, NPR’s Weekend Edition with Scott Simon and six starred reviews from industry publications were even more unbelievable. 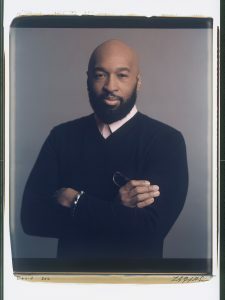 Amongst all of these honors, and others, I am probably most excited by my novel having been awarded the Coretta Scott King/John Steptoe award in 2018 by the American Library Association. And The Stars Beneath Our Feet is being adapted into a feature film by actor/director Michael B. Jordan as well. People who work in and around children’s publishing are special. From the librarians and teachers to the editors and authors, over the past few years, I’ve met some committed, caring and talented individuals throughout my travels. Child readers today are luckier, than when I was their age. They read more different types of stories about more different types of children. But we’re still not there yet. Not by a long shot. There’s a ton of work to do when it comes to full representation in children’s literature. For one, we need more diverse groups of people behind the scenes to help those new stories come about. Overall, I’m optimistic about what lies ahead. Though we experience particular setbacks, the prevailing march forward towards a better future does not stop. I’m truly hopeful for what’s to come. Learn more about The Stars Beneath Our Feet here and at David’s website here. I’m so excited about this – and I think that cover makes it SO accessible to SO many people. So many people love Legos – and there are many people who suffer from a failure of imagination who wouldn’t have thought a black boy would, so the cover is ESPECIALLY impressive on that point.